The film is well written, well cast and executed with heart and excitement. It’s a pity that the inevitable overindulgence in computer generated images had to be present, but for once it was balanced with some decent storytelling and “analog” wizardry. It’s like “The Goonies” only in the sense that it’s a kid’s quest, with nary an adult involved. 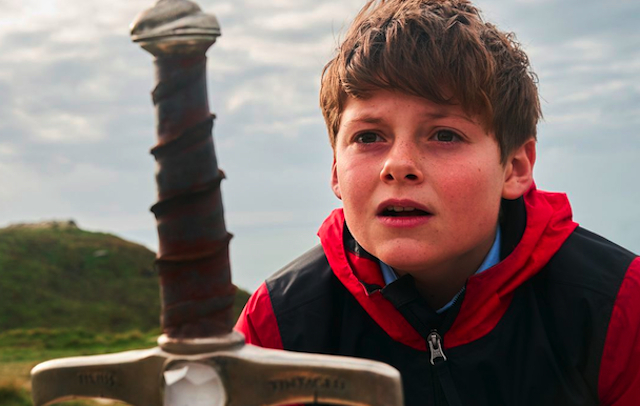 But the mythology associated with the quest is pure British, expanding upon the King Arthur legend and lessening the Disney effect by creating its own tale of kings and knights. The “kid” who would be king is portrayed as a charming outsider, who has had his courage all along, to emergge when his destiny came knocking. This is also one of those rare kid oriented films where the adults will be equally engaged.